A single carport is simply the easiest and best way you can get protection for your car, boat, caravan or motorhome. How Much is a Single Carport? The sizing of a single vehicle carport will vary, depending on the width, length and height you need. For example, a carport to suit a caravan or boat can be very different to something that suits a car. Caravans, boats etc. tend to be much higher and usually longer than cars. Typically a lot of suppliers see a single carport size to be about 3m x 6m, however Excalibur Carports have the ability to do just about any size that you need. 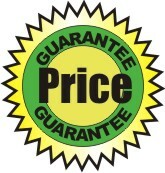 We can cater for pretty much any height that you may need, from a car to a motorhome or caravan. Let us know what clearance height you need so we can quote and supply a carport to suits. A Dutch Gable Carport can be done but you must think about how the finished product will look as Dutch Gable carport do not sometimes scale very well in these smaller dimensions. Australia is made up of different wind region. The higher the wind speed, the stronger the carport has to be (which is one reason why prices vary) . All wind areas are catered for in the carport designs, including cyclonic. 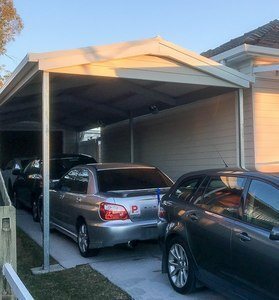 So no matter where you are, you will receive a carport that has been designed and quoted to suit your local wind and weather conditions. With a carport, the posts are the only things supporting and holding the carport up. So it’s fairly important to have the right size and strength. Post size can vary depending on several factors such as carport type, height and wind region. Unlike some others, we would recommend and use at least 75mm size SHS steel posts up to larger 100mm SHS posts in nearly every case. 125mm posts have also been supplied for large projects including schools, factories etc. Don’t make the mistake of buying a carport with posts that are too small. There are many benefits to adding a carport to your rental property. If it does not have any undercover car accommodation, it’s highly likely that you’re missing out on rental income and better tenants. By just adding a single carport, the tenant’s main car is protected, and that gives them peace of mind. The solution is simple and you’ll instantly reap the rewards. - Supplying Carports, sheds and Patios since 2001 with Excalibur Steel Buildings. - Supply professional engineering to meet all local council standards. - Quality materials for longevity and a professional finish. - Technical backup service to ensure your project goes smoothly.